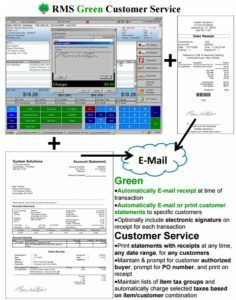 Systems Solutions LLC’s RMS Green Customer Service add-on provides the ability to automatically e-mail receipts at time of transaction and e-mail statements with optional receipt copies and signatures. 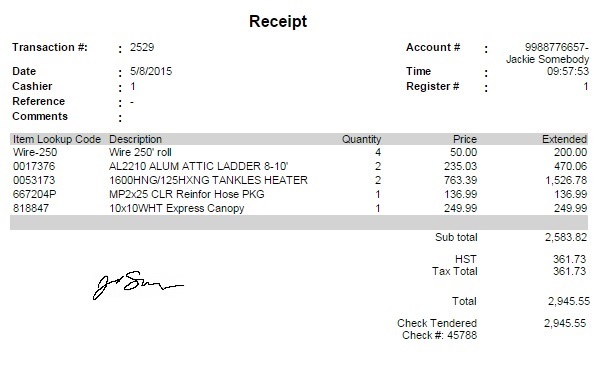 Also includes capture of transaction authorized buyer and purchase order number. If you would like to see this solution in action, watch our demo video. If you would like more information regarding this solution, please contact us. This entry was posted in Add-On and tagged Emailing receipts, Microsoft Retail Management System on May 17, 2016 by syssolutionsllc. System Solutions, LLC’s Microsoft RMS Merge Customers solution allows you to quickly merge two customers, by allowing the user to select one customer and transfer their sales information to another. The transferred data includes purchase history, account receivables, and more! 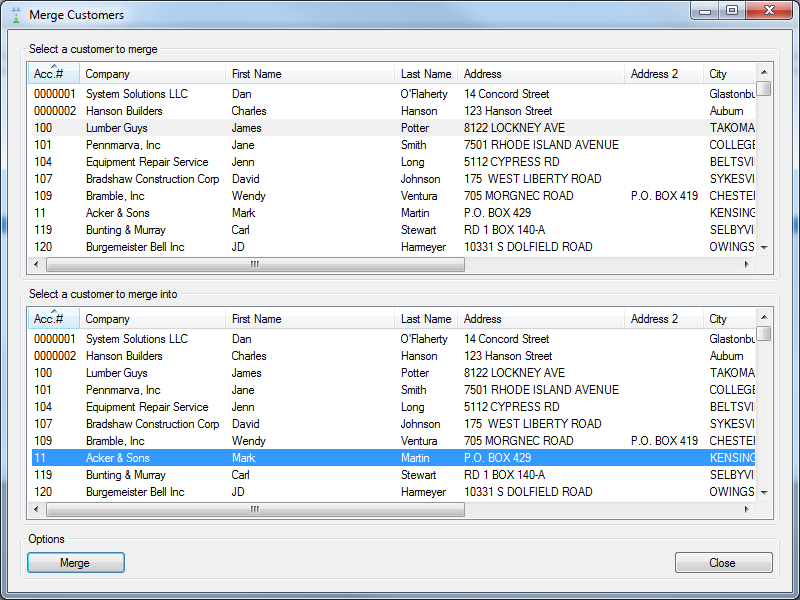 The merge customers solution, showing how to easily merge customers together. This entry was posted in Add-On and tagged Merge Customers in RMS, Merging data in RMS, Microsoft Retail Management System, Microsoft RMS, RMS Merge Customers, RMS Store Operations, System Solutions LLC, Transferring Data in RMS on June 9, 2015 by syssolutionsllc. System Solutions LLC’s RMS Ship To Item Price Memory automatically saves items with price changes made for one customer in POS with Ship To indicated. The new item price for that specific customer ship to is automatically saved and applied on future purchases and all other transaction types. Price change automatically saved and used for specific ship to address. If you would like to learn more about this solution, please click here, or to watch it in action click here. If you are interested in discussing this solution further, please email us here. 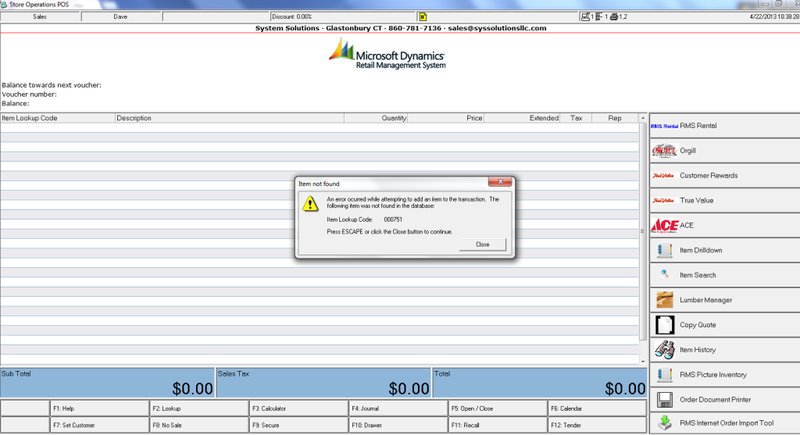 This entry was posted in Add-On, Point of Sale and tagged Auto save price change, auto save price change in POS, Microsoft Retail Management System, Microsoft RMS, Point of Sale, POS, retail price change auto saved, Retail Pricing Memory, Ship To Item Price Memory, Ship To Pricing, System Solutions LLC on June 2, 2015 by syssolutionsllc. 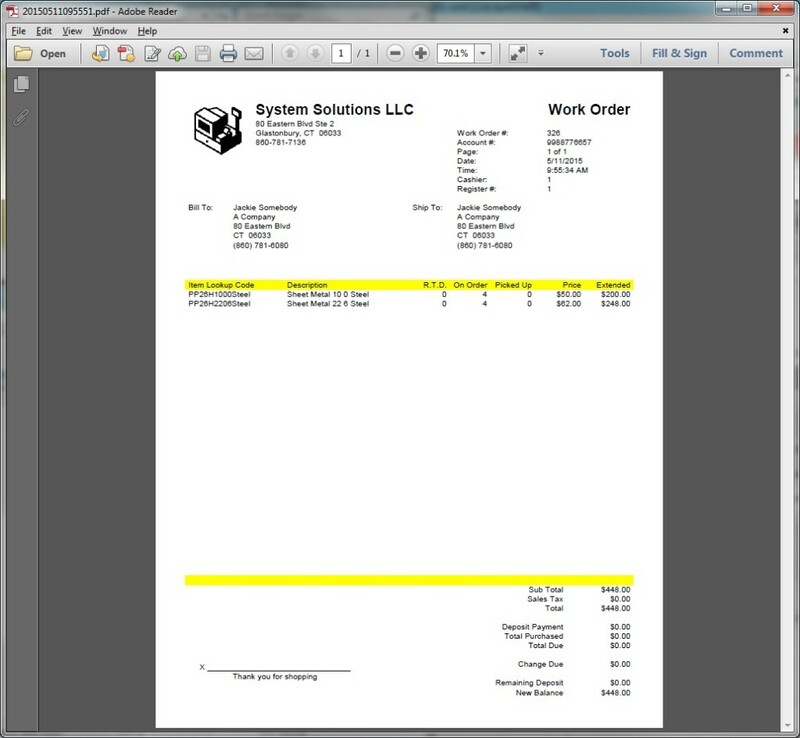 System Solutions LLC’s RMS Work Order to Purchase Order automatically creates POs from work orders created in POS for items needed in the warehouse. To learn more about this solution, please click here, or if you would like to see it in action, watch our demo video here. To contact us about this solution please email us here. 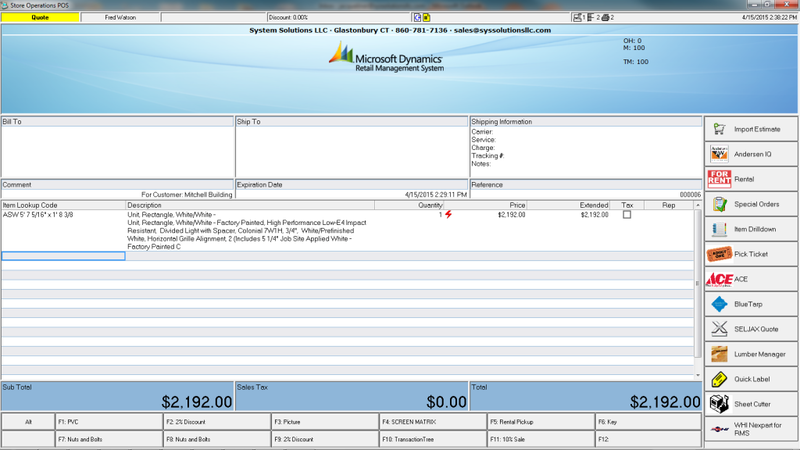 This entry was posted in Add-On and tagged Automatic Purchase Order Creation, Microsoft Retail Management System, Microsoft RMS, Point of Sale, Purchase Orders, Store Operations Manager, System Solutions LLC, Warehouse Items Work Orders, Work Orders, Work Orders to Purchase Orders on May 26, 2015 by syssolutionsllc. 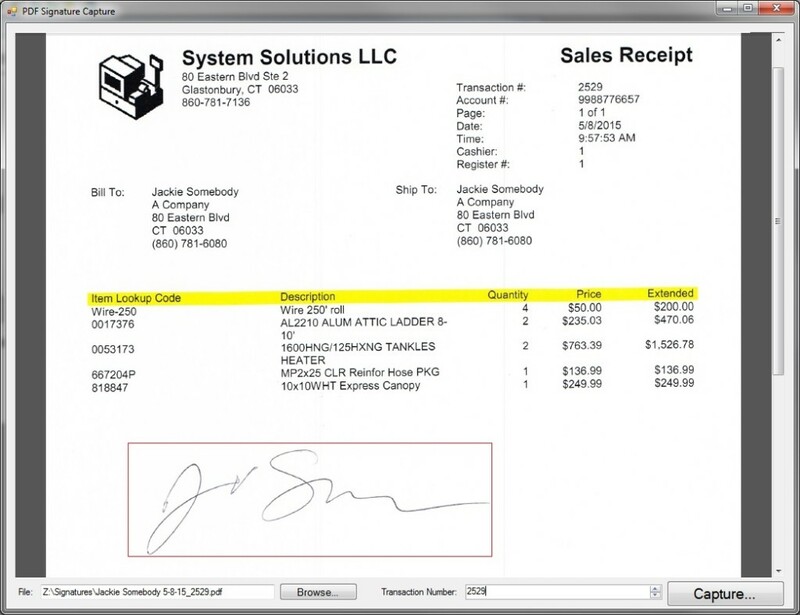 System Solution LLC’s PDF Signature Capture allows for remote signature of paper signed receipt to be scanned in and saved as a PDF to apply to receipt copies using SS Customer Statements. PDF Signatures are applied to customer receipts using SS Customer Statements. This add on is designed to work with SS Customer Statements. If you would like to learn more about this solution, please click here, or email us here. This entry was posted in Add-On and tagged Applying Customer signatures in Customer Statements, Applying Customer Signatures to Receipts, Customer Signature Capture, Customer Statements Customer Signatures, Customer Statements PDF Signature, Customer Statements Signature, Microsoft Retail Management System, Microsoft RMS, PDF Signature Capture, Retail Managment System Manager, RMS Manager, Store Operations, Store Operations Manager on May 19, 2015 by syssolutionsllc. System Solutions, LLC’s RMS Customer Tablet Entry allows customers to enter their information on a tablet while the cashier is scanning items in POS, so customer information is populated in POS for sale, with either clicking the custom POS button or just by tendering the sale. New customer tablet entries are automatically saved in RMS for future use. If you would like to learn more about RMS Customer Tablet Entry, click here or email us at sales@syssolutionsllc.com. 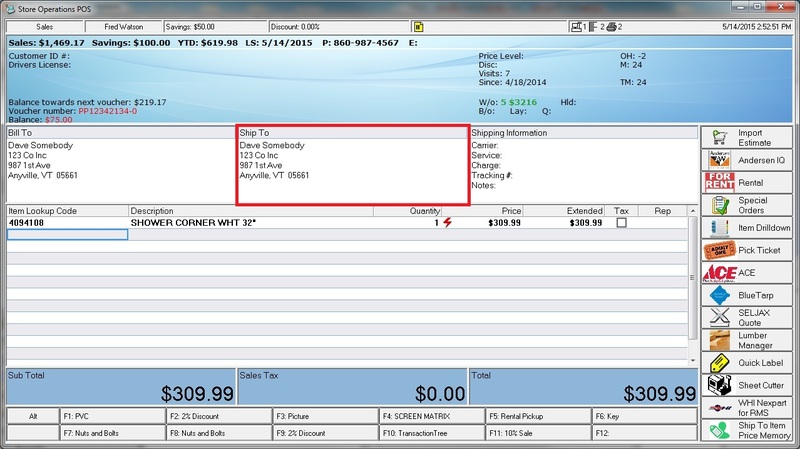 This entry was posted in Add-On, Point of Sale and tagged Customer Tablet Entry in POS, Customer Tablet use at point of sale, Microsoft Retail Management System, Microsoft RMS, Point of Sale, Point of sale tablet entry, RMS Customer Tablet Entry, System Solutions LLC on May 12, 2015 by syssolutionsllc. 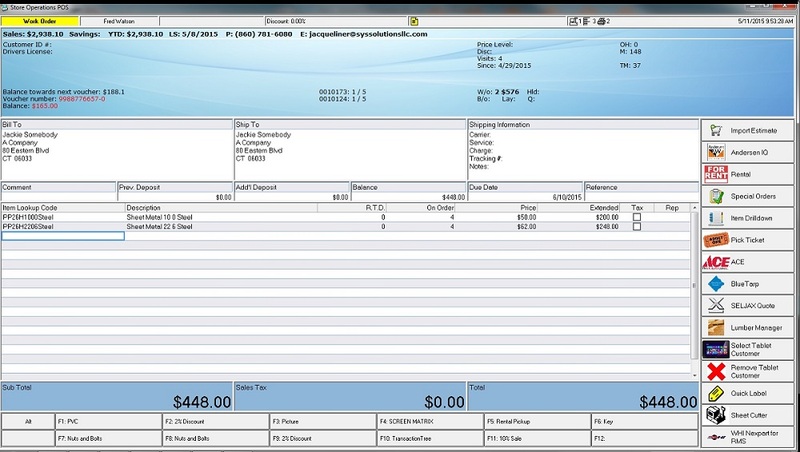 System Solutions Customer Form Manager is a great solution for those using forms in day-to-day point of sale functions. 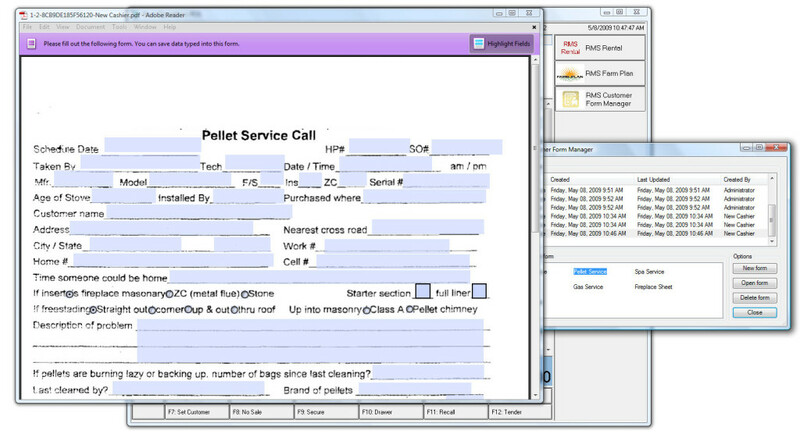 The Customer Form Manager allows cashiers to create, edit, and save fillable PDF forms from pre-defined templates at the POS screen. The form templates are created or scanned and configured as fillable using Adobe Acrobat. The cashier chooses from a list of form templates during a transaction and forms are automatically linked, saved, and retrieved for the currently set POS customer. To learn more about Customer Form Manager, click here. If you would like to speak to someone about this solution, please email us at sales@syssolutionsllc.com. This entry was posted in Add-On, Point of Sale and tagged Customer Form Manager, Customer Forms, Fillable Forms in point of sale, Fillable Forms in POS, Fillable retail customer forms in POS, Microsoft Retail Management System, Microsoft RMS, Point of Sale, System Solutions LLC on May 5, 2015 by syssolutionsllc. 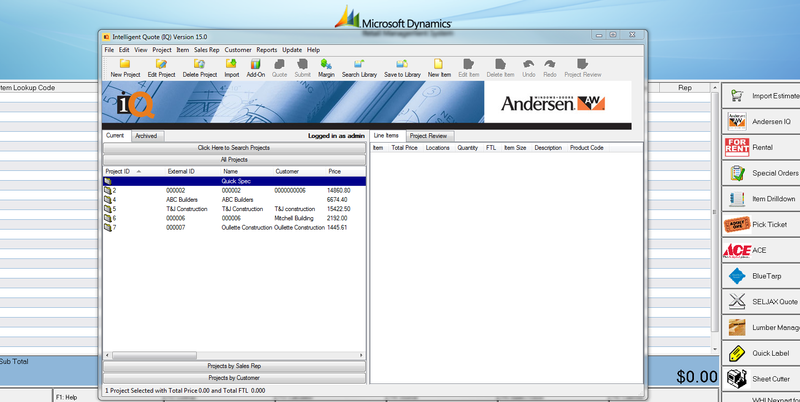 Microsoft RMS AndersenIQ Integration provides direct integration of Andersen Intelligent Quote software into Microsoft’s RMS point of sale and converts AndersenIQ window and door designs directly into Microsoft RMS quotes, sales or work orders. 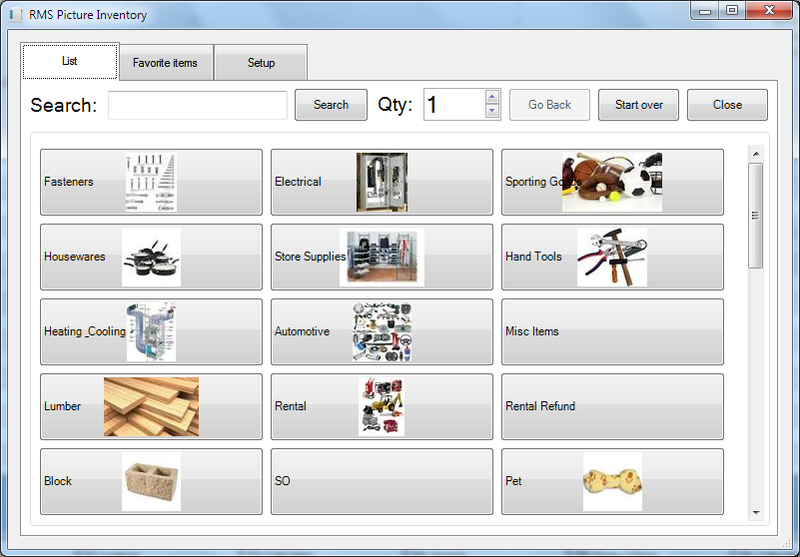 Users can use AndersenIQ Integration to: quote, sell, deliver, or install in Microsoft RMS. Custom POS buttons for direct integration. Easily import Andersen Intelligent Quotes into POS. Automatically creates new window and door items in Microsoft RMS. To learn more about this solution, click here or contact Dan, our AndersenIQ and Building supply store specialist for more information at dano@syssolutionsllc.com. If you would like to see this solution in action, please watch our demo here. 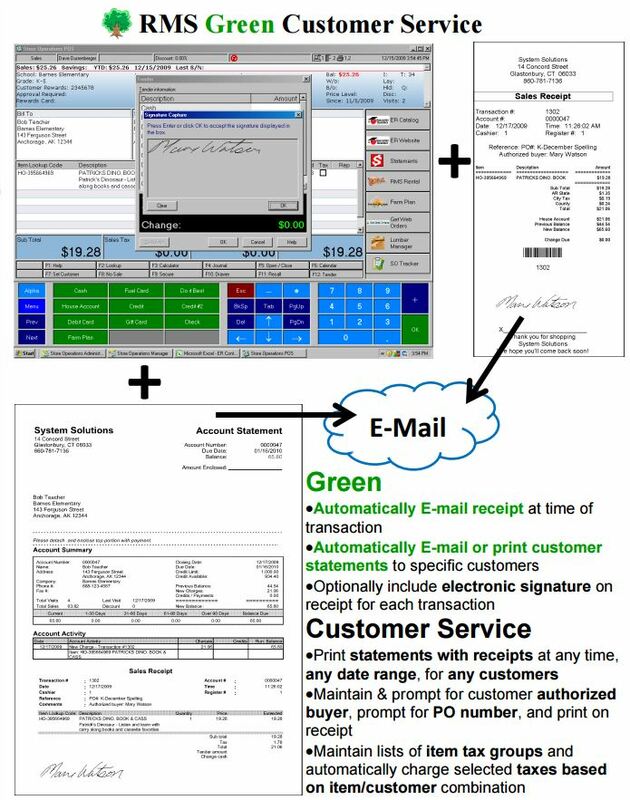 This entry was posted in Add-On, Point of Sale, Solutions and tagged Andersen Intelligent Quote, Andersen Intelligent Quote retail solution, Andersen IQ point of sale, Andersen retail solution, Builders retail solution, Microsoft Retail Management System, Microsoft RMS, Point of Sale, System Solutions LLC on April 28, 2015 by syssolutionsllc. The System Solutions Item Add Sound solution allows you to play a sound when an item is added to the transaction and it also plays a sound notifying the cashier when an item was not found, along with displaying an error message. You can choose from a variety of sounds. To see how this solution works, click here to watch a video. This entry was posted in Add-On, Point of Sale and tagged Item Add Sound, Item Sound notification, LLC, Microsoft Retail Management System, Microsoft RMS, Point of Sale, point of sale sound, Point of Sale Sound Notification, retail software, System Solutions on April 22, 2015 by syssolutionsllc. System Solutions Item and Picture Drill Down enables rapid location and selection of items at the point of sale. 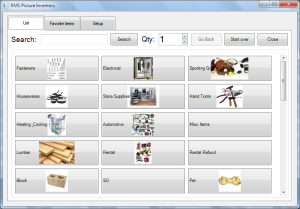 It allows cashiers to easily find items using a mouse or touchscreen, start at department level and drill down to categories and items, optionally word search for items, and allows for quickly adding pictures to any buttons at any level. To learn more about this solution click here, to watch a demo click here. This entry was posted in Add-On, Point of Sale, Solutions and tagged Easy Item Search in POS, Item and Picture Drill Down, Microsoft Retail Management System, Microsoft RMS, Point of Sale, Rapid item location in POS on April 14, 2015 by syssolutionsllc.